October 19, 2014 – As Comet C/2013 A1 Siding Spring made its closest approach to Mars at about 12:27 p.m. MDT this afternoon, Colorado-built spacecraft had a front row seat and were hard at work collecting data that scientists will use to gain insight into the origin of our solar system. In preparation for the comet flyby, NASA maneuvered its extensive fleet, which includes three orbiters and two rovers, in order to reduce the risk of impact with high-velocity dust particles coming off the comet. The orbiters were moved to Mars’ “safe side” during the time of highest dust exposure. The rovers, Curiosity and Opportunity, were protected by the planet’s atmosphere. Lockheed Martin built all three of NASA’s Mars orbiters, which include Mars Odyssey orbiter, Mars Reconnaissance Orbiter, and Mars Atmosphere and Volatile EvolutionN (MAVEN). Lockheed engineers maneuvered the spacecraft into the safe position and then monitored the health of the spacecraft throughout today’s event. The comet’s nucleus missed Mars by about 87,000 miles (139,500 km) or about one-third the distance between the Earth and Moon. The real worry to the spacecraft was not the impact of the comet, but the debris trail that extends behind it. As Siding Spring hurtled through space at about 35 miles (56 km) per second, even the smallest particles – estimated to be about one-fiftieth of an inch (half a millimeter) across – could cause significant damage to a spacecraft. Peak dust was expected between 1:57 p.m. and 2:17 p.m. MDT. The passing of Comet Siding Spring near the surface of Mars provided an unusual opportunity for scientists to observe a comet up close and learn about its effects on a nearby planet. Siding Spring came from the Oort Cloud, a spherical region of space outside the orbits of Neptune and Pluto that is made up of icy objects believed to be material left over from the formation of the solar system some 4.6 billion years ago. The comet, discovered on January 3, 2013, is on its first journey into the inner Solar System. Since Siding Spring has spent most of its life far from the Sun, the comet is much more pristine than those that regularly orbit the sun and that makes it particularly interesting for scientists to study. Siding Spring is the first comet from the Oort Cloud to be studied up close by spacecraft, giving scientists an invaluable opportunity to learn about our solar system’s earliest days. For Humm and other scientists who work on the orbiter missions, an event like the encounter with Siding Spring was not even considered during construction. Since Oort Cloud comets are only discovered 2-3 years before their closest approach to the Sun, it is virtually impossible to plan a space mission to fly by such a comet. Scientists are using the instruments on existing spacecraft to study the nucleus, the coma surrounding the nucleus, and the tail of Siding Spring, as well as the possible effects of a comet passing through the Martian atmosphere. On the surface of the planet, the rover cameras were used to observe the comet before the flyby and to monitor the atmosphere for meteors while the comet’s dust trail was closest to the planet. MAVEN will study gases coming off the comet’s nucleus into its coma as it is warmed by the sun. Last week, scientists from the MAVEN mission released initial observations which they will now use to get a detailed “before” and “after” look at the Martian atmosphere. Data will show whether there were changes in distribution of neutral and charged particles and how the comet’s coma interacted with the upper atmosphere as it traveled through. The principal investigator for the MAVEN mission is Bruce Jakosky of the Laboratory for Atmospheric and Space Physics in Boulder. Mars Odyssey has worked at the Red Planet longer than any other Mars mission in history. NASA launched the spacecraft on April 7, 2001 and Odyssey arrived at Mars October 24, 2001. In addition to conducting its own observations of the thermal and spectral properties of the comet’s coma and tail, Odyssey provides a communication relay for the rovers on the Martian surface. The instruments on MRO are unique in their abilities to study the comet. MRO is monitoring Mars’ atmosphere for possible temperature increases and cloud formation, as well as changes in electron density at high altitudes. The MRO team also planned to study gases in the comet’s coma and anticipates detailed views of the comet’s nucleus. The instruments could potentially reveal the comets rotation rate and surface features. Three of MRO’s instruments – the High Resolution Imaging Science Experiment (HiRISE), the Compact Imaging Spectrometer for Mars (CRISM), and the Context Camera (CTX) – began observing the comet days before the flyby and will continue to make observations of it in the next few days. 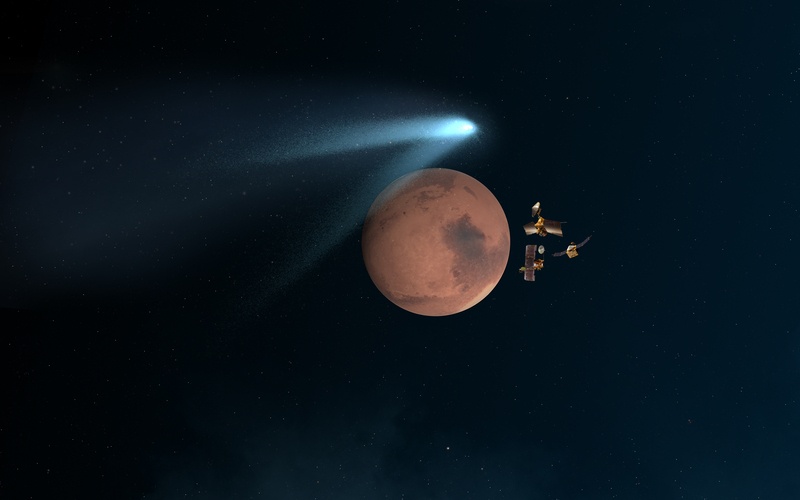 The orbiter’s other three instruments are being used to study possible effects of gas and dust in the comet’s tail interacting with the atmosphere of Mars. These are the Mars Climate Sounder (MCS), the Mars Color Imager (MARCI) and the Mars Shallow Radar (SHARAD). The HiRISE instrument was built by Ball Aerospace & Technologies Corp. in Boulder. “HiRISE is the only instrument that can image the nucleus of Comet Siding Spring with more than one pixel, and CRISM will have the best signal-to-noise ratio of any spectrometer that will observe the comet from close up,” said Humm. Following today’s comet flyby, operators of the MAVEN orbiter have reported that the spacecraft is in good condition and has returned to its science mission. Operators for NASA’s Mars Odyssey have also reported good health, and downlink of data has already begun from observations by the instruments on Mars Reconnaissance Orbiter. The full downlink of all data will take days. NASA and the European Space Agency estimate that it could be a week before images and other data will be released.